At a recent Lyme Disease support group in my area, I learned about Galaxy Diagnostics. It is a company that has some kind of PCR amplification system specifically for testing blood for Bartonella, including all 17 strains that can infect human beings. I was intrigued. I convinced my doctor to test me, since in the past I’ve had a series of inconclusive Bartonella antibody tests. I’ve been pretty sure that I have some kind of Bartonella, based on both my symptoms (which my original LLMD used to diagnose the infection) and my response to Bartonella-specific treatments. What I’ve wondered, however, is if I have a different Bartonella species that causes similar symptoms and similar antibodies, which aren’t quite what the standard Bartonella henselae test looks for. The timing is what has me wringing my hands. I’ve been making remarkable progress by coiling for Bartonella. My symptoms have been decreasing steadily, with a few blips, for a while. By no means are they gone, but they have been getting less and less and less. I have days when I feel on the verge of normal. The problem is that I’m much less likely to have a high infection load in my blood, which is what the test is based on. To that end, I’ve been doing everything in my power to convince the Bartonella bacteria to come out of hiding. I spent a week triggering the infection. Today, I send the samples to the lab. Sometime in July, I should have the results. Even with more symptoms, I’m concerned that I’ll get a negative result because the coiling over the past six months has been doing it’s job. Galaxy Diagnostics suggests doing the Bartonella PCR test by taking three blood draws over the course of 5 to 8 days. The idea is that Bartonella cycles in and out of the blood stream (occupying other tissue when it isn’t in the blood), so three draws increases the likelihood that it will be in the blood for at least one of the draws. The days I took the test were Tuesday, Thursday and Sunday, based on symptoms and on the plan to send it to the lab Monday (today). Last Saturday, I went to a birthday party for my friend’s daughter. Usually at parties, I sit out the cake because most cakes are made with egg. Since 2007, when the tick-borne infections became disabling, I’ve experienced an autoimmune response to eggs that targets my peripheral nervous system, as well as triggering a flare in the tick-borne infections. More recently, as the infections die down and I’ve rebuilt my intestinal microbiome, the autoimmune response has diminished. However, it is unpredictable, and for the most part, I avoid eggs. For this party, my friend was making cupcakes for the attendees. I contributed some of my own, made without egg. I used a modified form of a cake my sister makes for me, but which is good enough for those who can eat eggs. It’s an eggless chocolate cake that makes a mean cupcake. With it, I made a strawberry icing, just to break up the chocolate flavor, using strawberry jelly that my husband and I made last summer. Very delicious. The first cupcake had no effect. However, I had a cupcake or so each day for three days, Friday, Saturday and Sunday. By Sunday night, I had the first of the night sweats that continued for much of the week. Lighter than a sponge cake, moister than an angel-food cake, my husband makes a cake from scratch that is out-of-this-world. Unlike the closest version of the recipe that I can find online, Joe uses less vanilla extract and replaces it with a drop of almond extract. Then he makes his own chocolate icing, also from scratch. It was delicious. I had a generous slice on Monday. I kept my fingers crossed that I wouldn’t have a huge reaction to the eggs, only the minor, intended reaction of triggering the infections. I was kind of okay. About two or three hours later, I developed moderate chest pain and heart palpitations. Overnight, I had three night sweats and crazy dreams that were so vivid I was confused for an extended time after I woke up. Undeterred, I returned to the cake on Tuesday evening. This time, I had chest pain and heart palpitations less than 1 hour after consuming the cake. I had only 2 night sweats that night, both a little more intense than the ones the previous night. I woke up the next morning with joint and muscle aches all over my body. In addition to the intended Bartonella flare, it seems I woke up the Lyme infection. I coiled for it on Wednesday and have been without Lyme symptoms until they started again today (the following Monday). I didn’t want to push my luck, so I stopped after two servings of cake. The rest of the week, I ate chocolate in a variety of forms. I consumed the extra icing from the cupcakes and the cake as a spread on toast (move over Nutella!). I had a bubble tea. Just random sugar. The goal was to stress my body, increase inflammation and keep the Bartonella in circulation. As the week progressed, I had more headaches (including both tension headaches and migraines), more neurological pain in my hands and feet, especially in the morning, neuropathic tingling in various body parts over the course of the day, joint pain in my hands, left shoulder and neck, increased fatigue, eye pain, constipation, bladder problems, chest pain and the list goes on. Basically, I managed to trigger a Bartonella flare. I’m ready to swear off sugar for quite a while to come. During all this time, I’ve obviously not been coiling for Bartonella. It would be ridiculous to get it into my blood stream and kill it while I’m on a fishing expedition for live bacteria. On the other hand, I coiled for Lyme on Wednesday because I couldn’t deal with all the joint aches that the egg triggered. The Lyme coiling resolved the joint aches by the next morning, everywhere except my hands, which seem affected by Bartonella. The joint aches are coming back today, after all that sugar, and I’d like to start coiling for both Bartonella and Lyme. I can’t do it until the FedEx truck arrives to pick up my blood specimens because I can’t hear the doorbell when I’m wearing ear plugs and have the coil next to my head. With the time I usually spend coiling, I managed to practice yoga twice last week, until the neurological pain and the fatigue got to be too much. I’m trying Yoga With Adriene, 30 Days of Yoga. (You don’t actually have to sign up. All the videos are available on YouTube.) Of course, the way my body works, these don’t happen to be 30 consecutive days. As soon as I can coil away the joint pain, I’ll try it again. Maybe tomorrow? Yesterday, Joe and I spent a lot of time working on our little backyard. For us, it is Gardening 3.0 because it is the third attempt to make the backyard pretty, with low water use, and friendly to bees, butterflies and hummingbirds. We planted several bushes that fit all three categories. We also added a second section of succulents, one of which is hummingbird friendly when it eventually flowers. It was a lot of work (the bulk of which Joe did, but I did the share I could manage), and well worth it. 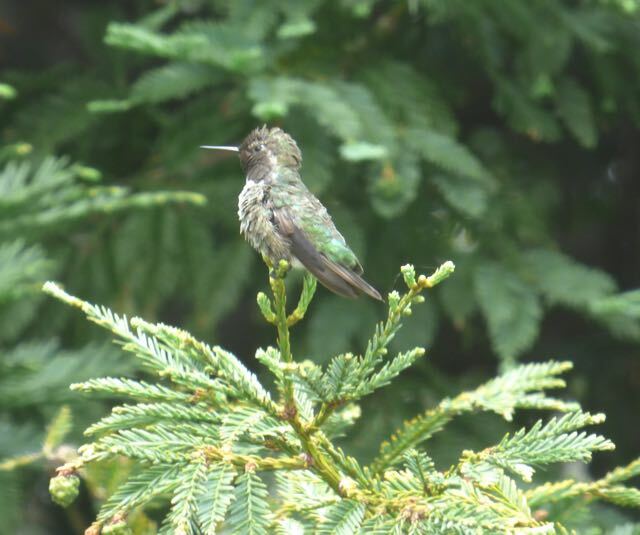 A humming bird sits on the sequoia outside my window. Apparently, the birds got the memo. While I’m typing, I’m listening to birds in my backyard. A pair of hummingbirds is flitting around. They come for the sequoia in our yard (and the other flowering plants that we already have back there). One of them stopped for a moment. Long enough for me to take a photo. By the time I got my camera out, the bird was looking the other way, so I couldn’t capture the red flash on its neck. Nevertheless, these are amazing birds.